Main Work Surface: 32" x 13.75"
Keyboard Tray: 27.75" x 9.65" x 1"-11.25"
Beautiful colors and finishes. Quality construction. Can be too heavy to lift for smaller, shorter users. Non-tilting keyboard. AirRise Pro is one of the nicer budget desk converters. 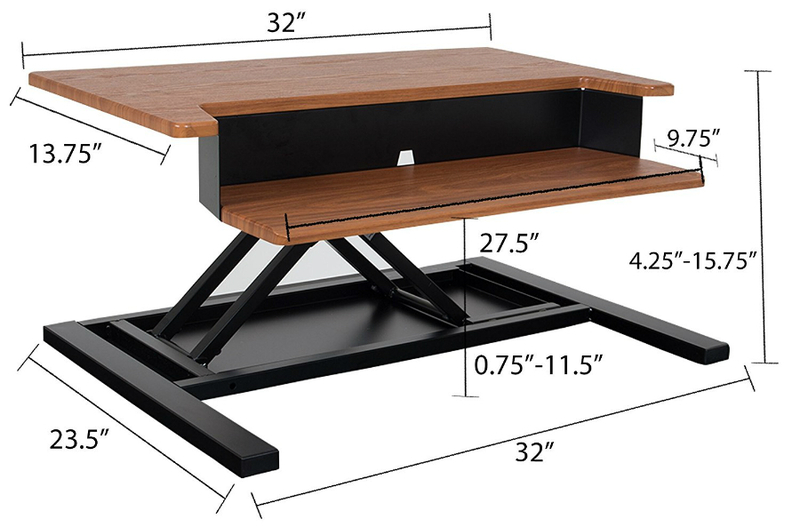 It also doesn’t have as many construction issues as other desks in the same price category. The non-adjustable keyboard tray has enough room for a keyboard and mouse. However, its maximum height is only 15.5”, which is considerably lower than some of its competitors. Editor’s Note: The following is a “forensic” review. We have not yet had the opportunity to test the AirRise Pro in our labs. When we have been unable to obtain a review unit from the manufacturer and when there is demand from our readers for information on the product, we evaluate publicly available information that the manufacturer and users of the product have provided online. 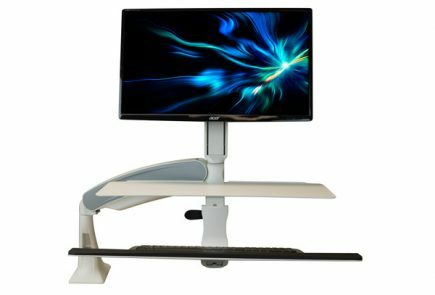 We then apply our extensive experience evaluating standing desk converters and make an informed projection of how well this product will stack up against other products in its category. As soon as we are able to conduct a hands-on evaluation of the product or learn new information about it, we will update this review. Learn more about our review process at Anatomy of a Review. The AirRise Pro is one of those rare budget converters that has minimal quality issues. Although it has a lower Amazon rating than some lower quality converters, it has fewer construction issues due to material failure. It’s a good choice for those looking for some variety color-wise. Its main drawback is that the desk is often hard to lift, despite its pneumatic technology with an air cylinder, which supposedly allows for smooth height adjustments “in a matter of seconds”. 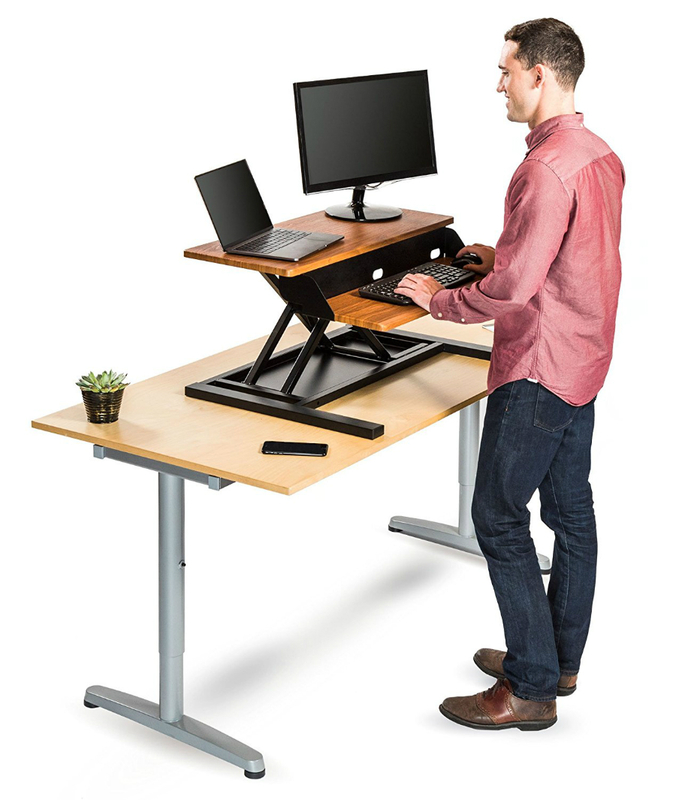 Users find themselves asking for help raising their desk when they want to transition into a standing position. plain black and white units, teak and white oak create a great contrast with the black base. 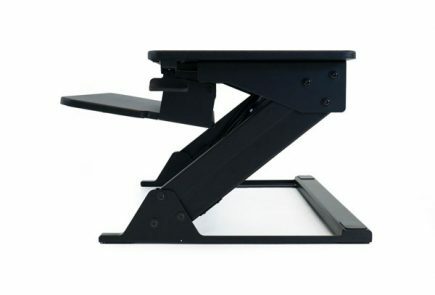 The converter is offered in four colors: black, white, teak, and white oak. Both teak and white oak boast a natural-looking wood grain finish while the white unit (priced $159) features a white base in addition to surfaces. While the majority of user reviews are absolutely positive, some of the consumer grievances that warrant lower ratings include: wobbling, too high or too low keyboard tray. 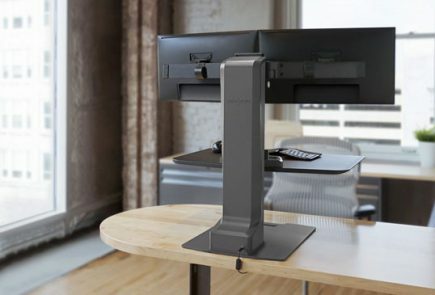 A considerable portion of user reviews report that the lifting mechanism does not perform as described, as the desk is too heavy to raise, especially if you’re using more than one monitor. 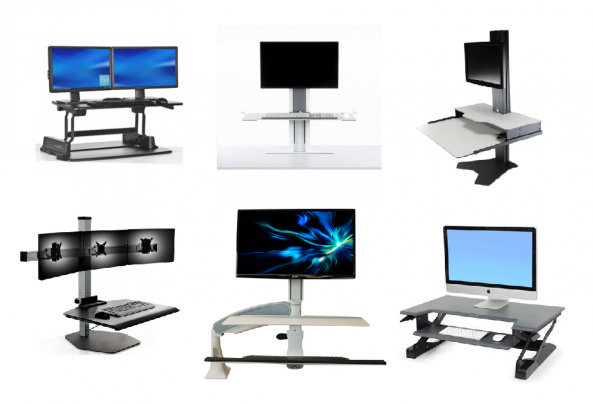 If you would like to learn more about the top standing desk converters on the market, see our Standing Desk Converter Comparison Review. And sign up for our newsletter to keep up to date on the latest office fitness products and industry trends.